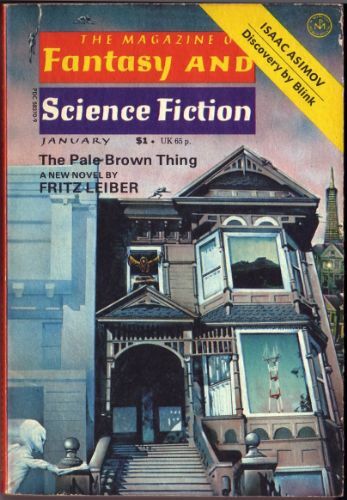 Upon it’s first appearance (as the slightly different ‘Pale Brown Thing’) in F&SF, it was given a mighty fine cover by Ron Walotsky . 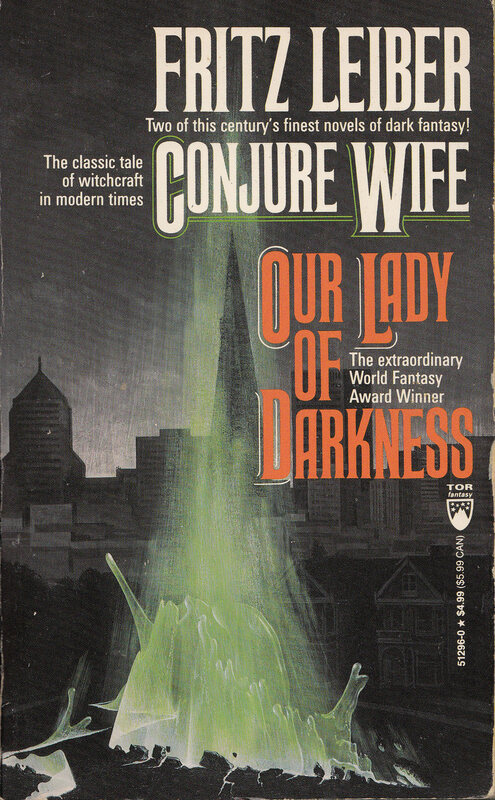 Whilst the building is merely a two story, the ambiance of the cover is great, it is daylight, and Corona heights and the TV tower are featured as reflections (with the metropolitan skyline behind). Paramentals dash and lurk around the composition, with a strong figure leaning out of the window. I like the realism of the piece, which mirror Franz’s hyper aware state of his environment, the clarity that lets him become aware of the paramental entities. F&SF did well by Fritz Leiber, and he had a number of fine covers, special mention should be given to the cover of ‘A Deskfull of Girls’ by Kelly Freas, a fine, fine cover indeed. The Putnam hardback release (and berkeley paperback) has a strangely retro cover. People tend to think of the seventies as a rather wild time for graphic design, but this was not really the case. By the late seventies, advertising and design was drfiting towards the international style, with sans serif typefaces on many designs, often with plenty of whitespace and dominant hero photos or patterns. This cover would seem to fit more sensibly at the end of the sixties or early seventies, and the ameoba like objects actually have a late fifties feel. 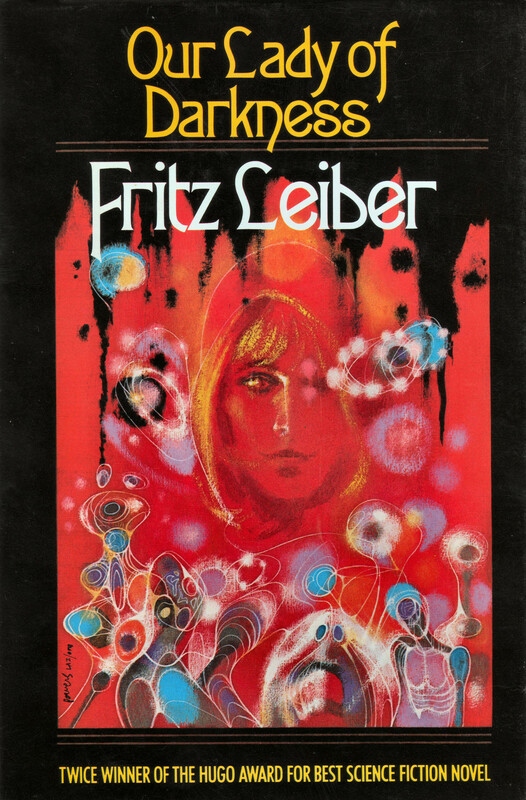 The frustration is I love some of Richard Powers work for Fritz, in fact this prolific artist produced an astonishing array of fine covers for numerous books over a long period of time. His cover for the ’62 version of The Silver Eggheads is terrific, as is his expressive version of Gather Darkness from the same year. 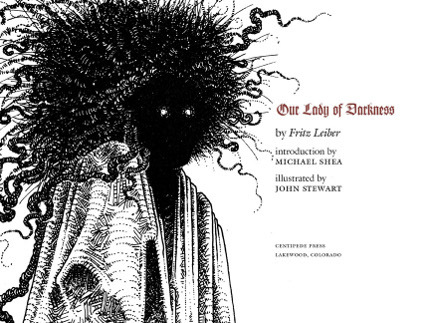 But looking at Our Lady of Darkness and his Pail of Air cover, one would think they are from the same year. I suspect this would not matter so much if I saw something in the cover which reflected the story, but it just doesn’t gel for me as a cover. The paperback cover is slightly better on the typographic font, with the neater text at the top. The Millington hardback doesn’t really tick any boxes either. 70’s UK hardbacks seemed dominated by photographic covers ( see the Clark Ashton Smith covers as an example). 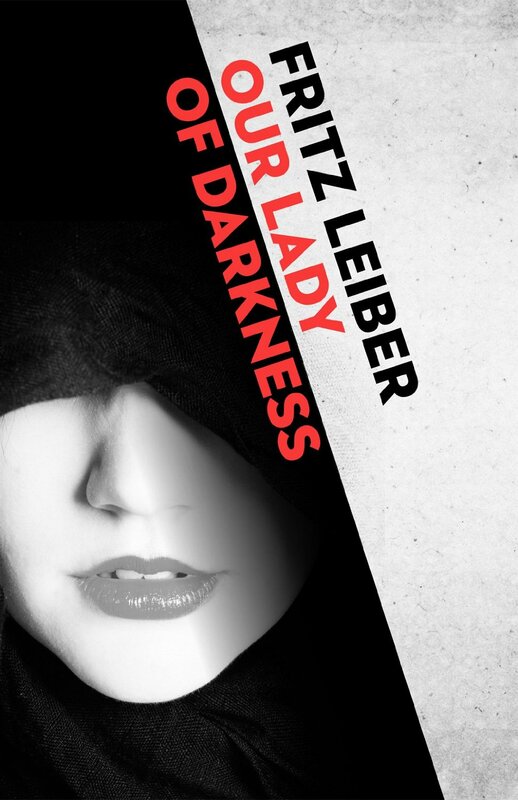 The cover’s gothic scene at least leads the buyer to the correct general genre, but the very fact the cover invokes graveyards and decaying churches seems to miss the point of Fritz’s decidedly metropolitan story. I probably still prefer it to the Putnam book, and it certainly is typical of it’s time, but is not a cover that inspires any real affection. The Fontana paperback on the other hand is a winner for me. 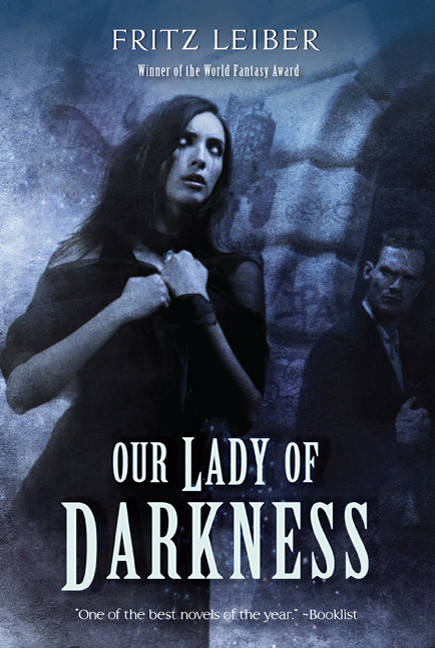 Recreating the Taffy scene from the book is a great idea, and the realisation of ‘Our Lady of Darkness’, with the paper making up her body is spot on. I also love the glossy ribbon like back hair spilling over figures shoulders. If that wasn’t enough, there are little details which add to the quality of the cover. The touch of art deco on the window frame, echoing the time the Thibaut De Castries wrote Megapolisomancy, the snouted face which fits well with Fritz’s description, and the red and white lines behind her, which echo both the TV tower and the abstract art which hangs in Franz’s apartment. Running behind is the San Francisco skyline, with the green of the hill at the bottom. Despite all these elements, the cover doesn’t feel crowded, and the text is given plenty of room. The figure positively leans out of the book at you, and carries with it a certain charge of sexuality, something missing from the Putnam and Millington covers. 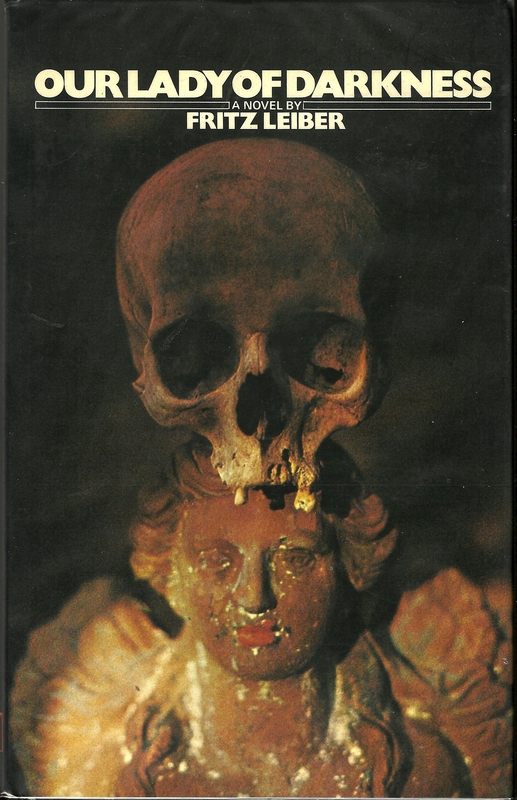 The cover also seems very modern for 1978, and it is difficult to think the cover is from the same time as the Putnam cover. The art is by Roy Ellsworth, I cannot find any real information about him or his work, but he absolutely nailed this cover. 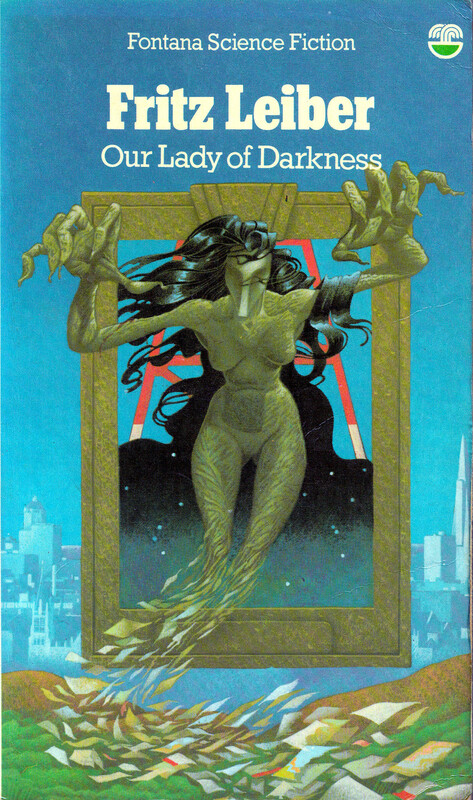 The TOR paperback of Our Lady of Darkness and Conjure Wife, boasts the talents of Wayne Barlowe, whose art has graced numerous books. His cover is interesting in that it ignores the feminine nature inherent in both the books (and indeed their titles) and instead draws on the urban horror, essential to both books. 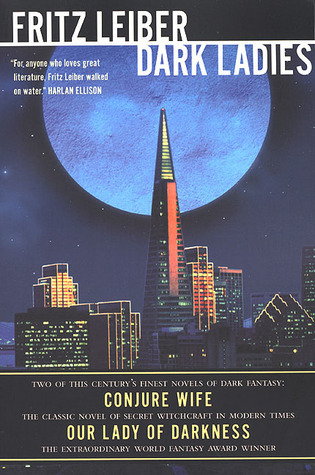 The eruption of the supernatural into the grimy urban background works well for both books (as it would for much of Fritz’s horror fiction) and the rising glow haloing the transamerica pyramid in the center leads to a very nice composition. 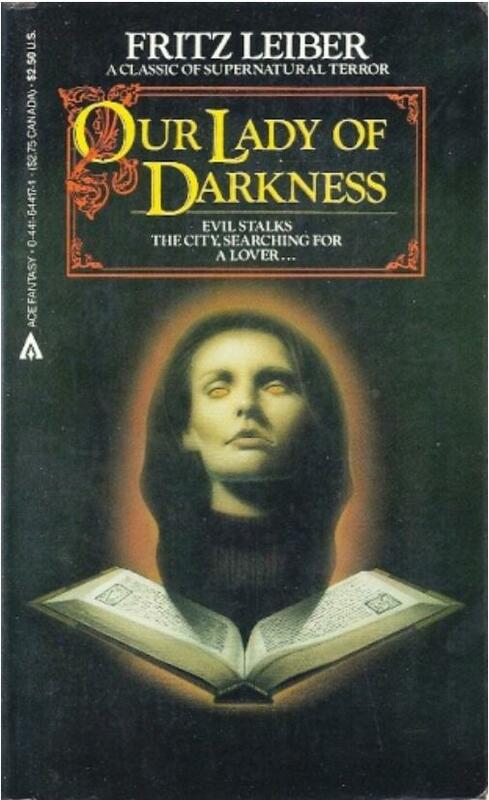 This is a cover that has grown on me over the years, the absence of a female at first seemed an obvious mistake, but the more I look at it, the more it seems to have sympathy with the tone of the books, be it the climax of Our Lady of Darkness, or the stone lizard stalking Tansy and Norman in Conjure wife..
Orb’s Dark Ladies paperback is very distinctive with the transamerica pyramid dominating the treated photograph. But the typography has always felt a little unbalanced, with the stylised author / title at the top, and the more traditional information bx at the bottom. These two elements letterboxing the skyline make one want something more dramatic, more cinematic maybe, but it is just not there, the moon seems a little too dominant for my liking. Mainly though, it doesn’t evoke the sense of urban unease that the TOR cover does so well. Orbs 2010 paperback is a big improvement. Chris McGrath is a very talented artist. His Conjure Wife cover for Orb is superb, but whilst I cannot help but admire the execution of this cover, it does not really echo the story for me. It has a 20s or 30s feel, so in some ways it works with the idea Thibaut was accompanied by a veiled lady, but more importantly the cover, despite it’s layer of soft grunge, does not give any flavour of the urban horror inherent in the novel.